Non-rigid registration methods are capable of aligning images where correspondence cannot be achieved without localized deformations and can therefore better accomodate anatomical, physiological and pathological variability between patients. B-splines are often used to parameterize a free-form deformation (FFD) field. This is a much harder registration problem than any of the previous examples due to a much higher-dimensional parameter space and we are therefore best off using a multi-resolution approach with affine initialization. This is very easy to do in SimpleElastix. Consider the following mean image of two different subjects. Figure 13: Mean original image. The result image is seen below. Figure 14: Mean result image. In this case, we are able to compensate for many non-rigid differences between the two images. 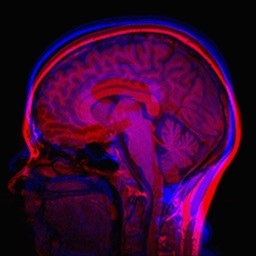 Note, however, that brain image registration is a difficult to task because of complex anatomical variations. Entire registration packages are dedicated to brain image processing. You might want to consider a more refined approach in critical applications. In the next section we introduce groupwise registration, where many images are registered simultaneously a mean frame of reference.